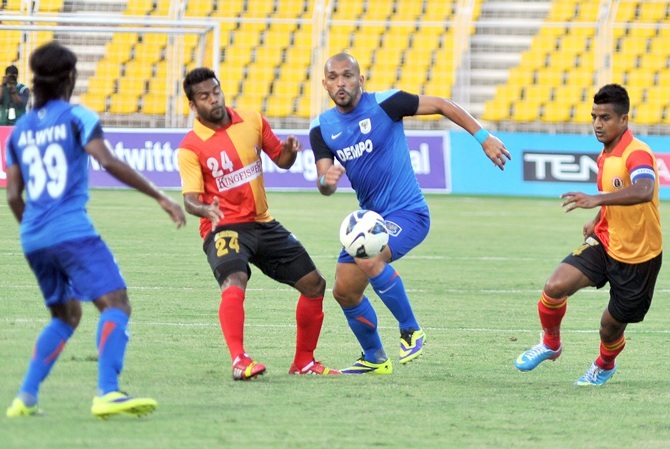 Dempo beat East Bengal through Tolgay Ozbey's 75th minute goal in the 18th round encounter of the I-League, played at the Nehru Stadium, Margao on Sunday. With Sunday's win, Dempo took their tally to 22 points from 17 matches and moved to the 6th place, while East Bengal ahead of their derby match against Bagan remained on 19 points from 13 matches. Both the teams started well and shared honours in the first half as they could not penetrate each other's defence. Dempo had a first chance in the 17th minute but Roberto Silva's left footer went straight into the hands of rival keeper Gurpreet Singh Sandhu. With few minutes to go for the interval, East Bengal were reduced to ten men when defender Gurwinder Singh pushed Haroon Amiri from behind. Referee Vishnu Chauhan had a tough time separating the players, and showed red card to the red and gold custodian. 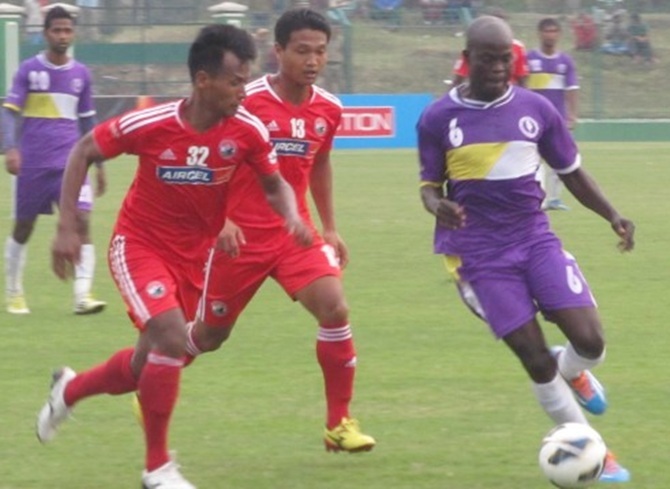 Dempo took advantage of the reduced rival side. In the 75th minute, Dempo captain Clifford Miranda sent a measured high cross into the box from the left, and Tolgay Ozbey found the net with a strong header. Mumbai FC were held to a 1-1 draw by league-leaders Bengaluru FC in a hard fought encounter at the Bangalore Football Stadium, in Bangalore. Defender Ebi Sukore put Mumbai FC ahead in the 47thminute before striker Robin Singh (55th) pulled the hosts level. With this draw, Mumbai FC took their tally to 18 points and stay in the 10th place in the standings. Both sides went into the break tied at goalless. The second half was a different story as Mumbai FC came out of their shell and began attacking. Defender Sukore, inside the rival box, did well to control Mohammed Rafi's cross in from the left on the turn before finishing past the helpless keeper. The goal gave Mumbai FC confidence; however, it was the hosts who capitalised on a defensive lapse to equalise seven minutes later at the other end. Creating space on the right, medio Beingaicho Beikhokhei chipped in a cross allowing Robin to head in from close. Into the final quarter both sides created several half chances but had to settle for a 1-1 draw. A fit-again Uilliams Bomfin made a spectacular comeback to affect Shillong Lajong FC's turnaround from two goal down to hold United SC and return to top four in Kalyani, West Bengal. United SC looked all set to dominate with goals from Eric Brown (13th) and Waheed (22nd) in the first quarter. But debutant Durga Boro (30th) pulled one back after being set up by the Brazilian forward who also scored a 55th minute equaliser to earn 2-2 draw and shatter United's hopes. The North East side have 21 points from 16 matches, compared to United's 20 from 17 as the script for the United SC folded much like in their last match when Mumbai FC had scored a stoppage time equaliser.